I'm so excited to have found a new link-up! 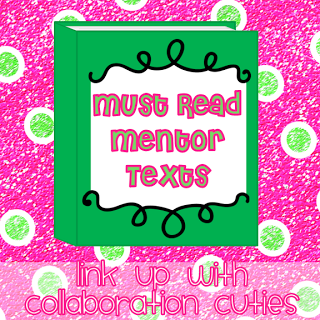 I'm now following collaboration cuties, and I'm linking up with their Must Read Mentor Texts. 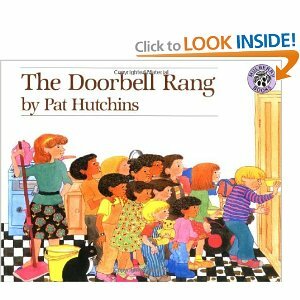 This week's texts are to be about math, so I'm suggesting The Doorbell Rang, by Pat Hutchins. Maybe you all know about this book, maybe not. It's the first one I learned about when I took Marilyn Burns' Math Solutions class oh so long ago, and it has so many possibilities for lessons! The Math Solutions lesson is about fractions, and you can download a PDF of the lesson here. There are so many versions of this lesson, that I've attached several. Click here and here for more. I actually use this book in second grade to introduce division, not fractions. As you probably know, the story is about a family who has just baked fresh chocolate chip cookies and is about to sit down to enjoy a few when the doorbell rings, and company is invited to join the family in eating the cookies. This continues to happen throughout the story - my kiddos just love the repetition, which makes for a great tie-in to the common core rhyme and repetition standard, too! After reading, I distribute dessert-sized paper plates and paper cookie manipulatives to groups. I then talk about how to share the cookies equally among the members of the groups. In some cases, we actually do get to sharing fractional parts, but that is definitely an extension lesson in second grade, not the first day for most students! After posing several problems, using different numbers of cookies and people in groups, I announce that we've just been doing division. My class never fails to oooh and aaah that they are doing such "grown up" math! 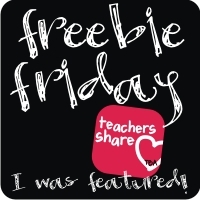 Click the picture below to get a copy of my Sharing Cookies lesson. Thanks for checking it out! We have so much fun with this book, and I usually have some Chips Ahoy for after the lesson! I haven't read this book yet...but sounds like I need to get it. I am in first but even at the end of the year we introduce fractions now with common core standards. This sounds like a perfect read a loud to give my firsties exposure! :) Thanks so much for sharing and giving us all of the great activities to go a long with this mentor text! Thanks, Amanda! It is a really cute book...firsties would love the predictable text, and love doing the big people math! I love using this book for division! I've used it in the past in 3rd and we used Cookie Crisp cereal as our manipulatives. The kids love it. I have not tried using it with fractions, but that may be a fun idea to try now that I'm in 4th! I'm so glad you linked up! Thanks for hosting, Amanda! Just be sure to offer scissors when doing the fractions lesson! And, obviously, use the paper cookies! I love this book and never thought about using it for fractions. Thanks for the link, too! I've use Marilyn Burns stuff before, and they are always good.